New renderings unveiled for Mia Lehrer and OMA's FaB Park in L.A. - Archpaper.com New renderings unveiled for Mia Lehrer and OMA's FaB Park in L.A.
New renderings unveiled for Mia Lehrer + Associates and OMA’s FaB Park in L.A. The new iteration of the FaB Park features a greater number of trees and shade structures, according to the new renderings. Designs for the forthcoming First and Broadway (FaB) Park by Mia Lehrer + Associates (MLA) and Office of Metropolitan Architecture (OMA) have been reconfigured to address community desires of Downtown Los Angeles residents. 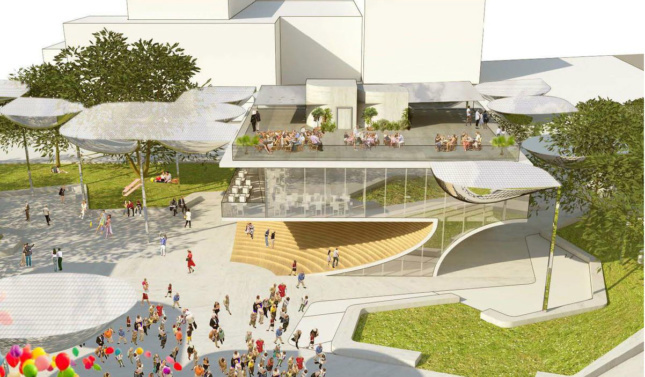 The new designs, portrayed in a collection of new renderings, depict a more leafy proposal for the two acre park than was originally proposed. The original design featured a central plaza flanked by groves of native plantings, sunken terraces, and a 100,000-square-foot food pavilion. The proposal was also dotted with large-scale shade structures and contained a small creek at its southwest corner. 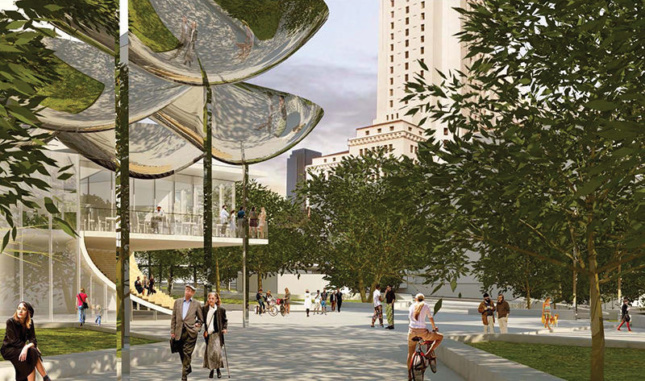 The new iteration of the project features a greater number of trees and shade structures, according to the renderings. The scheme also features a new 10,000-square-foot meadow that grows out of the creek bed, which had been retained in a reconfigured shape. 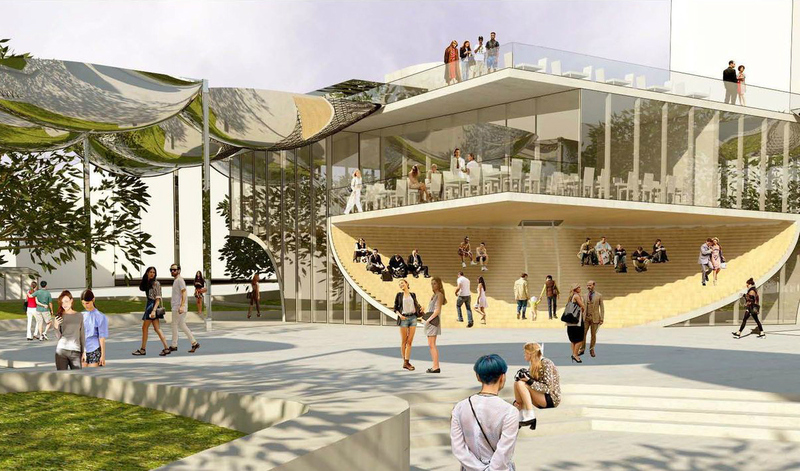 The designers have also improved the food pavilion by adding a rooftop terrace and shade pavilion beside the structure. The two-story structure will host a restaurant, though a vendor has not been selected and there are community concerns regarding the future restaurant’s affordability. The project is expected to break ground in 2018 and be completed by 2020.